Description: CSX 5106 is on the point of P-966, The Ringling Brothers, Barnum and Bailey Circus train at Iona Island, NY 4/28/2003. Description: North Bound on the River line. Description: Coming out of an early sunday morning fog. Description: Q438 Accelerates north past the NYS&W locomotive servicing area. Description: Q296 with the new horse in the consist and the air test complete is on the move passing by the old B&O station. 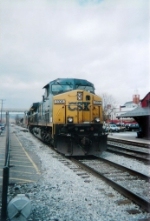 Description: SB on the CSX passing Sunwatch Indian Village (my son was there on a field trip and saw the same train not knowing i was photographing it at the same time). Description: Q111 westbound at CP 188. 111 has since been discontinued in 2009. Description: Two CSX GE wide cabs power a westbound intermodal as it crosses Bennetts Corners Road. Description: CSXT 887 trails as the second unit on a westbound intermodal. Description: And back to Pennsy just in time to catch a Q438! Description: Camp Meeting Ave., 1257 hours. Description: Q119 westbound at Weedsport with 260 axles. Since 2009, Q119 is now Q019. Q119 number replaced Q115 from this timeframe. Title: CSX 5106 leading the bunch somewhere; up the east slope of Sand Patch. Description: CSX Q110-02 is observed by a couple FEC engineers, as it clatters east across the NKP diamonds. Description: POSE crusies up to Sandy Pond Rd.